Dockless bikeshare firms are fleeing the city of Dallas in the wake of new regulations meant to reduce bike-littering. The city was once home to an estimated 20,000 dockless bikes belonging to four different bikeshare companies, but nearly all of those businesses have left in the past two months. Dallas became the unlikely epicenter of the dockless bikeshare wars after LimeBike showed up unannounced last year. Before, national cycling activists had often ranked Dallas as one of America’s most bike-unfriendly cities. An earlier, city-backed attempt to launch a traditional bikeshare program went disastrously wrong because officials placed all of bike “docks” or parking spots in the same deserted section of the city. Those weaknesses turned out to be a recipe for success in a city with flat terrain and numerous paved bike paths around town -- at least for the bikeshare companies that could do business without the nuisance of a dock. What began with complaints about dockless bikes blocking sidewalks turned into shows of who could get the most creative with bikeshare pranks -- one homeowner woke up to a pile of dozens of LimeBikes in his front yard, and an artist in January sawed a LimeBike in half and attached each piece to a telephone poll. Even as officials and residents complained, business was great, and competing dockless bikeshare companies began descending on the city. LimeBike initially blamed Dallas residents for the litter, but it later promised to employ more people to clean-up after the inventory. Unsatisfied, the Dallas City Council in June passed what they said would be reasonable regulations to encourage faster clean-ups. Under the new city ordinance, bikeshare companies would have to pay a $21 annual permit charge for every bike in their fleet and an additional annual charge of $800. Other guidelines said that bikes would be impounded if they sat in residential neighborhoods for more than two days or blocked narrow sidewalks. LimeBike, which has raised an estimated $1 billion from investors, said after the regulations were passed that “we applaud the city of Dallas for looking at innovation.” That apparently didn’t mean much, however, as the company left the city not long after. Two other companies followed. Ofo, which was valued at upwards of $2 billion last year, was the final hold-out. After deciding to leave, a company spokesman initially claimed that 250 of Ofo’s 5,000 bikes in Dallas would be sent to a local charity. 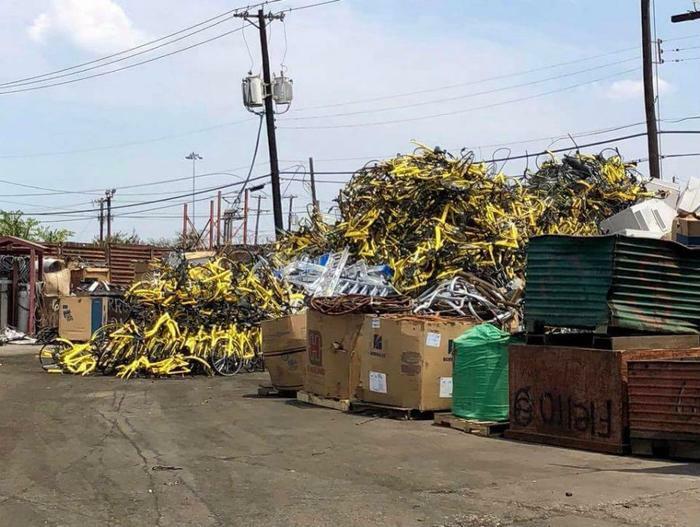 But not long after, photos surfaced online showing hundreds of Ofo’s yellow bikes piled outside a recycling facility that reportedly sells scrap metal. “As we wind down select markets, we remain committed to environmental sustainability and will continue to donate Ofo bikes in good working condition to local communities and recycle all bikes when they’re beyond repair or no longer able to use,” Ofo said in a statement.